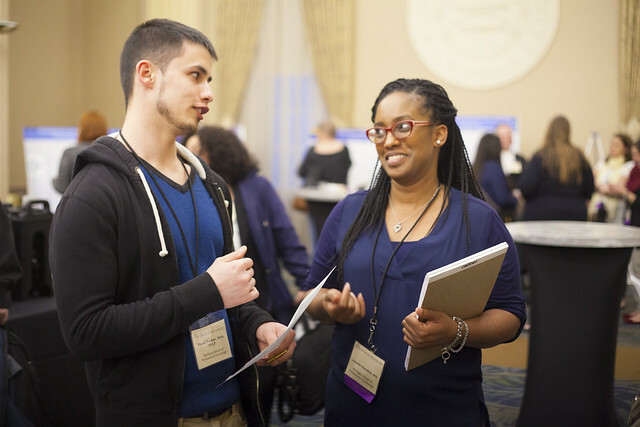 Point Park University students had unique access to more than 130 psychology practitioners and researchers from across the nation at the 10th Annual Conference of the Society for Humanistic Psychology, Division 32 of the American Psychological Association, held on campus March 30 through April 2. From presenting their therapeutic art work and psychology research to volunteering and networking, Point Park students were involved in the conference in a variety of levels. "I knew this was something I wanted to become involved with after seeing all of the hard work my professors put into this conference," said Chelsea Chase, an M.A. in clinical-community psychology graduate student from Lake Shore High School in Angola, N.Y.
Chase added: "As a student volunteer, this was an amazing opportunity to learn about the latest research in humanistic psychology and make really positive connections within the field. I got to meet and work with some truly amazing professionals." "It was a wonderful networking opportunity for our students to meet and mingle with leaders in the psychology field," said Sarah Schulz, Ph.D., LSW, assistant professor and director of the M.A. in clinical-community psychology program. The conference centered on the theme, "Love, Ethics, and Social Justice: Transforming the Self in the Service of Others," and offered more than 70 presentations, workshops and panel discussions, including those led by Point Park psychology faculty and graduate students. "As a student volunteer, this was an amazing opportunity to learn about the latest research in humanistic psychology and make really positive connections within the field." "It was a wonderful networking opportunity for our students to meet and mingle with leaders in the psychology field." Vanessa German, a visual and performance artist based in the Pittsburgh neighborhood of Homewood and founder of Love Front Porch and the ARThouse, a community arts initiative for the children of Homewood. "Vanessa German mentioned that she rarely speaks to groups so our students were really treated by her visit and we were honored to have her," explained Christina Frasher, M.A., part-time psychology instructor at Point Park and a presenter at the conference. "We were also very honored to have Mary Watkins, who is internationally known in the field of liberation psychology." Also at the conference, Point Park Associate Professor of Psychology Robert McInerney, Ph.D., was honored with a mid-career award for his work in the field of humanistic psychology. "Several people said this was the best conference the Society has held since its inception 10 years ago. I am extremely proud of our beautiful university and the faculty, students, staff and supportive administration, without whom the great success of this conference would not have happened," said Brent Robbins, Ph.D., associate professor of psychology and chair of the Department of Humanities and Human Sciences. Robbins added: "This conference allowed us to strongly reassert Point Park's University's psychology programs as nationally renowned for our humanistic approach to the study of the person."